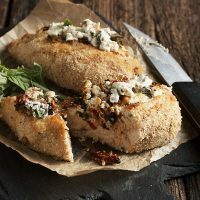 Boneless chicken breasts, stuffed with a mixture of goat cheese, sundried tomatoes and basil. Coated in Italian bread crumbs. Easy and delicious! Make the filling by stirring together all the ingredients in a small bowl. Set aside. Stand chicken breast on it's side. Using a sharp knife, cut a slit in the top of the chicken breast, about 1/2 of the way into the breast and leaving 3/4-inch at either end of the slit. Repeat with the other chicken breast. Divide the filling between the two chicken breasts, filling the pocket. *I like to save a little bit of the filling to spoon on after cooking, since I love the combination of the cooked goat cheese with a little bit of fresh. Flatten the breasts slightly. Spread bread crumbs on a plate. Lightly brush the chicken breast with olive oil, then gently press the bottom and sides of the chicken breast into the bread crumbs. Place onto a baking sheet. Repeat with second chicken breast. Bake in preheated oven for 30-35 minutes, or until thickest part of the chicken registers 165F using an instant read thermometer. Remove from oven. If you saved a little of the filling, divide between the two. Let stand a few minutes before serving.